Beyond the complications of living with a severe medical condition, patients needing an organ transplant face a long waitlist. This process can take 3-5 years on average, and often patients are unable to find a donor at all. This wait is frightening and can be isolating without support and guidance from others. Reorganize is an online community, connecting organ transplant patients by aggregating stories posted on various social media channels. Patients can share their health goals, obstacles, and story in a personalized way, allowing them to find others in a similar situation and need for support. Connecting with other patients not only helps with emotional comfort but helps to widen the network of potential donors. The platform narrows down the search to streamline the patient-to-patient matching process based on organ type, blood type, and distance. 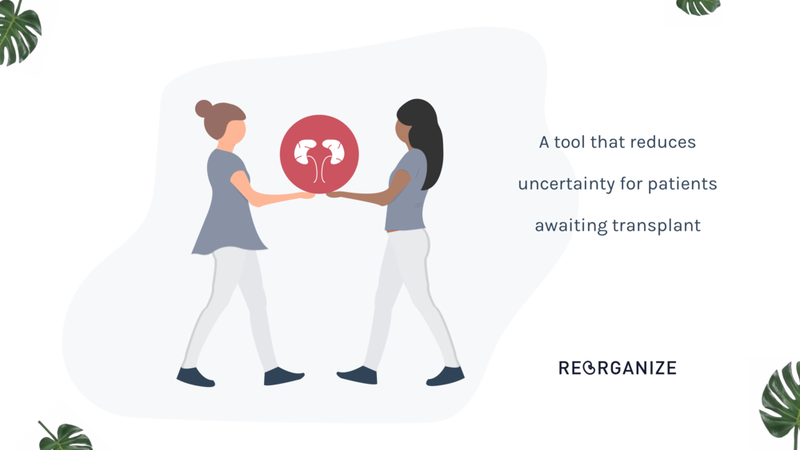 Reorganize empowers patients to connect with the broader community who can understand them and increase their odds of locating a potential donor.